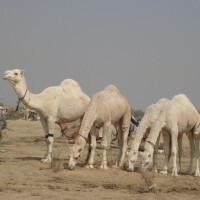 Camel is a cool, happy and calm animal. Opposite to common believing as dangerous, this unique creature has a soul with love and remembrance. Camel realize the feelings of a person or animal approaching camel. Camels’ reaction is always the same in response. Love camel and get love. Sometimes an angry camel (may be by some one else) can make trouble if you approaching but it is very uncommon. Once an already angry camel cow tried to have a bite from my shoulder but I was smart enough and escaped. She was very loving camel in nature. I astonished. Then after an hour, when I met her again in the milking parlor, she put her head on my shoulder as an excuse. I inquired and knew that she was angry on a handler as he treated her harshly. Thanks very much Dr Usman for camel promotion.